That’s water that you can use for irrigation, toilet flushing, laundry, or even whole house potable (drinking) use. That’s right! 624 gallons. If you have a 1,500 square foot roof area in the Seattle area, this equates to 33,642 gallons of available water. Water that you don’t need to pay for. You can save money on your water, and sewage bill and, over time, pay for your system with that savings. Depending on the application of the captured rainwater, you can supplement your usage through a simple collection system for irrigation or by plumbing in your toilets and laundry facilities. Or, if you choose to have a whole house system designed and installed by a professional, you can eliminate your municipal water usage altogether and have city water as only a back up supply. Water quality of collected rainwater after filtration and UV disinfection is above that of a municipal water supply, as long as the system is designed, installed and maintained properly. Annual costs of maintenance is much less than your current water bill and is easy to do. Periodic cleaning of your gutters and screening devices along with filter changes a few times a year and replacement of the UV bulb once a year is all there is to it. Many people in the Seattle area are opting out of city water usage whether it is for potable or non potable use. 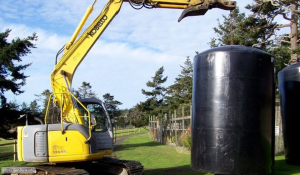 Supplementary tanks with a small amount of storage can offset your water bill as much as 80%. A decentralized private water system eliminates the possible threats to your drinking water from environmental concerns, water advisories, price increases, additives such as chlorine and fluorides and possible rationing, such as in California. You are in control of the quality of your water and its use. 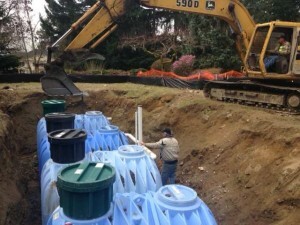 Rainwater collection is a viable source of water that can sustain any household in Washington State. 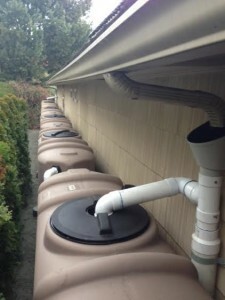 RainBank Rainwater Collection Systems has been designing and installing rainwater systems in Washington for residential and commercial applications for over ten years and is a American Rainwater Catchment Systems Association Accredited Professional. How can I be sure that the person and company designing and installing my rainwater collection system is qualified? Seminars, conferences, continuing education, and resources are a few advantages that ARCSA members can benefit from, giving ARCSA members a host of opportunities to advance in the industry. After all it was ARCSA members that introduced Rainwater Collection to be a viable source for water and storm water runoff solutions. Here are some frequently asked questions covered by ARCSA. Concerned With Aesthetics of Above Ground Water Storage? This is Part 6 in the series “How to Build a Rainwater Collection System”. Click to see parts one, two, three, four and five. Are you concerned with the aesthetics of above ground water storage? Then underground storage may be right for you. Underground storage tanks need to be structurally engineered to withstand the inward pressures of back filling and compacting. Most will need to be weighted down so ground water will not “float” the tank when empty. It is advised that a curtain drain be installed at bottom of excavation to allow excess ground water to drain away for the same reason. Buried tanks can be fiberglass, plastic, and cement. Large sizes (over 2,000 gallons) tend to be fiberglass, while smaller plastic tanks (up to 2,000 gallons) can be manifolded together to achieve the desired capacity. 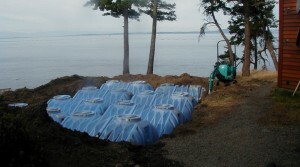 Cement tanks should be lined with a poly liner and “mono poured” when constructed. Other specialty tanks consist of modular which are may be buried and bladder or pillow tanks that can be placed in crawl spaces. Check the box below to follow RainBank and stay informed of all things Rainwater Harvesting.